Citation: C N Trueman "Challenges to Royal Supremacy"
historylearningsite.co.uk. The History Learning Site, 16 Mar 2015. 7 Apr 2019. The religious changes that occurred in the early 1530’s were undoubtedly of major importance but it was not true that everyone accepted them. Groups of opponents to these changes developed and one of these revolved around Elizabeth Barton – the Holy Maid of Kent. Barton, a nun at St. Sepulchre’s Convent in Canterbury, claimed that she had a series of visions of the Virgin Mary and that she had been spoken to. The ‘Holy Maid of Kent’, as Barton was known as, was widely respected in the southeast of Kent by both rich and poor. Many feared her powers as she would go into religious trances for days at a time. From the start Barton rejected Henry’s demand for an annulment and she told him this to his face in 1532 claiming that he would be punished by God and die a “villain’s death” if he went ahead with his planned divorce from Catherine of Aragon. When the divorce was announced in May 1533, Barton made public her views. These were that Henry would be overthrown in one month, either by God or by the people acting on behalf of God. The real fear among Henry’s advisors was that she would spark off some form of public discontent in Kent and that the government would find it difficult to contain as it had the dangerous element of religion ‘attached’ to it. The government acted to tarnish her name and Barton was accused of having sexual relations with priests and monks based in Canterbury. The Holy Maid of Kent was swiftly arrested along with some of her supporters. They were brought to London and Barton was forced to declare that her visions were a hoax and her proclamations false. Barton and five of her associates were put in the Tower of London. The Reformation Parliament, supported by Henry, who was not prepared to show mercy, passed an act of attainder against all of them in 1534 and they were executed in April of that year at Tyburn in front of a very large crowd. The government’s swift action ended what could have developed into a difficult situation. 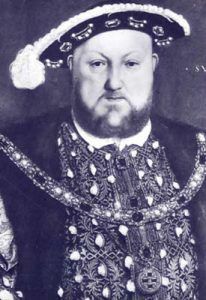 The Holy Maid of Kent was not the only challenge Henry faced from religious groups to his planned divorce. Henry also faced criticism from, amongst others, the Observant Franciscans and Carthusian monks. The most irritating thing from Henry’s point of view was that both religious orders were seen as being almost at the top of spirituality and goodness within the country. Henry’s worry was that if these two orders were willing to criticise him, it might stimulate others to do the same and that this would spill over into the lay community as a result of the example given by the various monastic orders. Both the Observant Franciscans and the Carthusians had quarters either in London or very near to it. The Observant Franciscans had a friary next to the royal palace at Greenwich while the Carthusians had a centre at Charterhouse in London. Least of all would Henry want to face disorder in London if the people did rise to support these two monastic orders. In a society where religion played an important part in day-to-day life, there was always the chance that lay people would latch onto the lead given by men who had devoted their life to God. Henry and his government had to act quickly and decisively. All seven Observant Franciscan houses were shut down in 1534. The monks were ordered to remain out of public view or face arrest. There is little evidence to find out exactly what happened but it is thought that about thirty were arrested and died in prison while the rest – about 170 – faded from view as was demanded by Henry. However, a different approach was tried with the Carthusians. Some in the London Charterhouse were openly critical of those who took a more hard line approach against the king. The same was true in the houses run by the Carthusians in the provinces. Thomas Cromwell hoped to harvest this lack of support as evidence that the majority of Carthusians supported the stance taken by Henry. However, by arresting those who were vocal in their attacks on the king, Cromwell only succeeded in uniting the rest in support of the arrested – some of whom were executed. The Carthusians took a stand and over three years eighteen were arrested and either executed or starved to death. They were eventually forced into swearing an oath of allegiance to Henry and they were allowed to continue as an order for a short while. However, their treatment proved to be valuable propaganda to Catholics abroad and many viewed their treatment as a king and his government simply acting as bullies against a group that could do very little if anything to physically defend themselves against the state. The historian Keith Randall describes the whole episode as Henry’s “least defensible action”.